When it comes to oureach, I’ll get real with you here, I am the worst for reaching out. There, I said it! I have been unbelievably fortunate to have had some amazing opportunities over the last few years, but they’ve all started with an email that has come in my direction, and never the other way around. I know I should be ashamed to admit this, after all I am forever preaching that blogging shouldn’t be about the numbers but, I’ve always been of the mind that my numbers/community here in the Wonderland doesn’t seem big enough for me to think anyone would take me reaching out to them seriously. 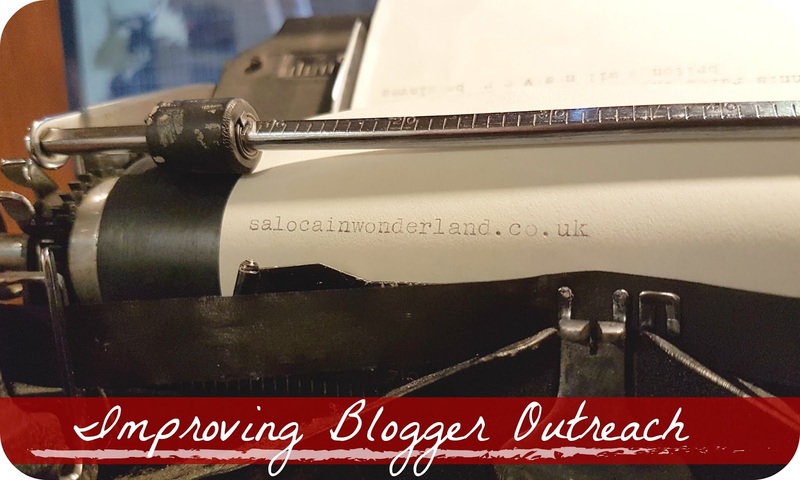 It's time I improved my blogger outreach services! I’ve always thought of my blog as the perfect hobby, It gets me out, it pushes me to try new things, gives me a creative outlet and a voice to share my interests and thoughts. I find so much comfort and joy in what I’ve created so far, and I know my blog could do and be so much more than it currently is. Seriously guys, if I work at this, if I throw myself into the arena and actively look for more paid blogging opportunities, I’ve got nothing to lose and everything to gain. And the same goes for you. So here’s a couple of things I’m going to try in order to turn this hobby of mine into something with a real future! I know the freelance work isn’t necessarily posted here on the blog, but I think I can use my blog as a decent portfolio to showcase my voice and ability. Plus anything that keeps me writing and challenges me can only be a good thing! So I’m hoping to at least get a client or two under my belt this side of the New Year - I can see this being a big goal for next year! The beauty of a lifestyle blog is that you can pretty much write about anything, but does that mean you should? I don’t want to go sending emails out to anyone and everybody I can find out there in the hopes that someone bites. PR’s are much more specific about who they want to work with, what kind of audience they want to see their product, so I feel like I should be more specific when it comes to the products/ideas I share on here. Inevitably, that does mean (and something I have done) turning down some well paid opportunities. But I’ve got to start thinking about personal branding and a more cohesive style/theme around here. So I’m going to crack out the coloured pencils and start on some mind mapping! I’ve had this conversation with a few blogging buddies now, some say have one, some say it doesn’t matter. But I’m thinking this will help with potential follow up emails when PR’s ask about stats. If I can send it all out in one pretty, professional, neat little package (and figure out how to Elle Woods scent-style an email!) then that should hopefully answer a few more questions up front and I might get get an opportunity sooner rather than later. Turning your blog into something more than a hobby means you’re going to have to give it the attention of a small child. It needs your love, devotion, and discipline to grow into a somewhat functioning member of society/a semi-reliable income. Not the easiest thing to do when you already have a full time job, a Netflix addiction and are a sociable critter. So time needs to be carved out somewhere. I’ve started taking what I call writing days off from work. The plan is to lock myself in the house from 9 - 5, gather my hair up in a messy bun and get sh*t done. I used to have a blog schedule and I used to stick to it like glue, but the last few months I’ve not made enough time to generate the content that a schedule requires. In theory, these days should help me get ahead with content creation, leaving me more time to promote/email/Netflix binge. There are hundreds, if not thousands of posts out there on how to improve your blog and turn it into something to be proud of and/or can at least pay the phone bill each month. I want to spend more time doing my research and putting some of the ideas I come across into practice. Like everything else these days, blogging and social media are moving at a million times an hour, and I don’t change up my approach I’m going to get left behind. Are you ready to try and take your blog to the next level? How do you plan on doing it? *This post is on collaboration with GetBlogged. All thoughts, opinions, hopes and dreams are my own. For more information please see my disclaimer policy. I do plan on taking my blog to the next level. I will be using your wonderful tips to do it. Thanks for sharing.